Earlier In THIS POST, we learnt how to swipe In horizontal or vertical direction In any android software app using driver.swipe() and swiping element in horizontal direction using action chain In previous post. 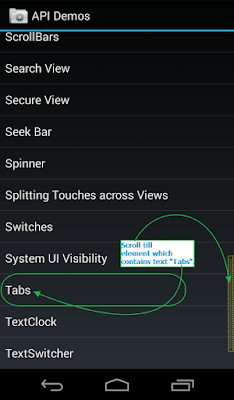 Most of android applications contain list view and you need to scroll down to select specific element. You can use scrollTo(String text) method of IOSElement class If you wants to scroll down till specific text in appium software automation test. 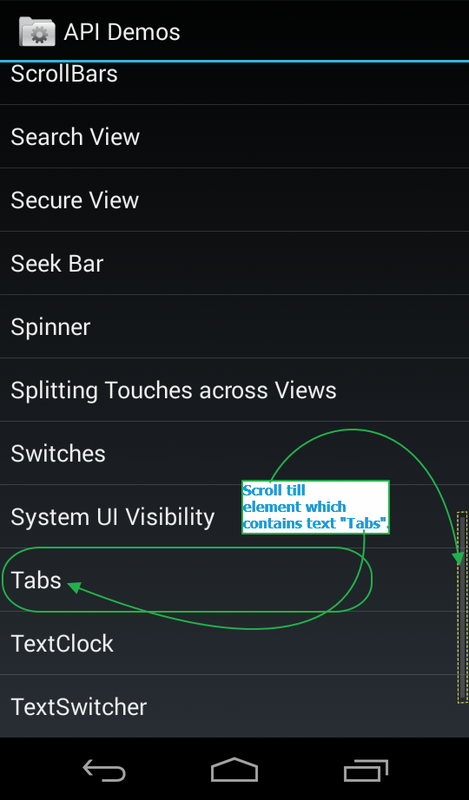 Let's try to Implement It practically In android software appium automation test to know how scrollTo(String text) method works. PREREQUISITES : All previous 21 steps of appium mobile software app automation tutorials (PART 1 and PART 2) should be completed. We will use API Demos In this example. You can download API Demos android software app from GOOGLE PLAY STORE or THIS PAGE. Install It In your mobile device. We wants to scroll down till selected element which contains text "Tabs" as shown In bellow Image. And then we wants to tap on It("Tabs" text). Manually you can view bellow given scroll-able listing in API Demos software App from API Demos App -> Views. On next screen, Scroll down till element which contain text "Tabs". And tap on element which contain text "Tabs". Create ScrollingToText.java file under Android package of your project and copy paste bellow given test script In It. // Scroll till element which contains Tabs text. If you look at above test example, We have used driver.scrollTo(String text) methods for scrolling. It will scroll down steps by step and look If given text Is displayed on screen or not. When text appears, It will stop scrolling. First driver.scrollTo("Views"); will check if element containing test "Views" Is display on screen or not. If not display then It will scroll down down and check for text once again. Same way, Second driver.scrollTo("Tabs"); will scroll down and check for text "Tabs". To see scrollToText demo practically, Run above test using testng and appium and observe result on your android mobile screen. This way you can scroll down vertically to find specific element and click on It. This ScrollTo and ScrollToExact is not working most of the times.Appium scroll beyond the desired element. ScrollTo method is not working on my Phone and Emulator. I used driver.scrollTo("Tabs"); but nothing happens. Do we need to do some setting on developer options to use it? Hi.. I tried all the possible ways but couldn't find scrollTo(). It gives error "The method scrollTo() is undefined for the type WebDriver"
Hi, I tried all possible ways but couldn't get driver.scrollTo() working. It is giving error "The method scrollTo() is undefined for the type WebDriver". Please suggest me how can I add scroll. My app is a hybrid app. Define your driver as Appium driver in the beginning of your code. scrollTo is a method defined for appium driver. there is not method in the androidDriver and webdriver. Is there any alternate solution as in the new appium release the scrollTo() and scrollToExact() methods have been deprecated.? Just want to scroll to a particular element on the android app. what if scrollTo doesn't get the expected element?? Will it throw an error? In recent update appium "mobile : scroll" deprecated, following code will work and video will help you to implement. Hi, could you tell me what I should pass to ++ in your above code? Even I the video, I did not see he talk about that. //Tap on Basic usage Playground. Ok guys this is not going to work By.name is deprecated.Try following thing to scroll.